Co Down suckler herd owner Michael Griffith will continue to use synchronisation to improve herd performance and reduce workload. The key point taken away by 100 plus farmers from the AgriSearch suckler beef farm walk hosted by the Griffith family at Saintfield Demesne. “Our experience of using synchronisation on heifers for several years and this past year on the entire herd has been very encouraging,” Michael affirmed. One of 10 farmer co-researchers working with AFBI scientists to assess the role of synchronisation and AI in improving the woeful returns from suckler herds. Michael is also a vet and consultant in Jubilee Veterinary Centre, Newtownards. On 330 acres Michael and family run 70 suckler cows and 280 ewes as well as growing oats. NI suckler herds average just 18 cows with many run by part time farmers, who find it hard to justify buying a good bull. Only AI can potentially give them access to genetics that will best match individual cows and take the herd forward. Synchronising cows can make AI a practical option as it typically ensures 60% of cows hold to first service to calve over 7 to 14 days. Dramatically reducing the time spent checking on those due to calve. 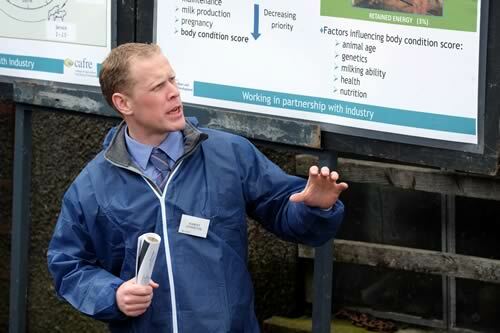 Discussing the results from farms taking part in the trial AgriSearch field officer David Anderson warned that only cows with a clean bill of health, a good calving record, the right condition score and temperament should be used. Scanning, before AI takes place, at least 42 days after calving, is essential as are good handling facilities. Because Michael moves his cows around fields to tie in with grazing sheep the herd is quieter than most. Typically the total cost of synchronisation and AI is £40 per cow, but has huge advantages compared to buying and keeping a bull. Michael Griffith noting that many herd owners are also sheep farmers or have off farm interests so synchronisation offers them more control of when calving happens. “The other major plus point of this very useful tool is the ability to select bulls to suit your cows and your needs. Do you need a bull that will produce milky herd replacements? Or is DLWG and easy calving more important? “We all like to think we have an eye for a good bull, but using a bull without figures is a gamble far too far given the minimal margins we currently endure.